We see GDP growth slowing from our already modest forecast of 1.6% in 2018 to 1.0% for 2019, primarily due to weakening household consumption. The income fundamentals are still rather strong, with unemployment close to the lows of 4.5 - 5.0% and real wage growth still in the mid-single digit range. However, this doesn't translate into higher consumer confidence because only 25% out of Russia's 73 million employees see an acceleration in the salary growth, which is mostly budget-driven. The increase in consumer confidence is limited as the electoral cycle is over too. The remaining 75% of employees (except IT and telecommunications, which account for 2% of Russia's employees) don't see faster salary growth and are instead focused on accelerating inflation, upcoming VAT rate hike and increase in the retirement age. The silver lining in this reality is that the current slowdown in household consumption growth from 2.5% in 2018F to 1.0% in 2019F doesn't reflect declining income, but a somewhat higher preference for savings - making future improvements in the consumption trend a matter of confidence. We see investment growth also slowing down from 3.0% in 2018F to 1.5% in 2019F as large investment projects related to the World Cup are completed. The pipeline of government-sponsored investment projects for the next six years totals around RUB six trillion including three trillion financed from the budget directly, which means less than 1% of GDP per year. Demand for borrowed funds, which is driven by non-state sectors, seems to be limited. In 2017-18, the rise in the corporates’ debt burden made up RUB 1.3 - 1.5 trillion per year against RUB 3 - 6 trillion in 2011-13. 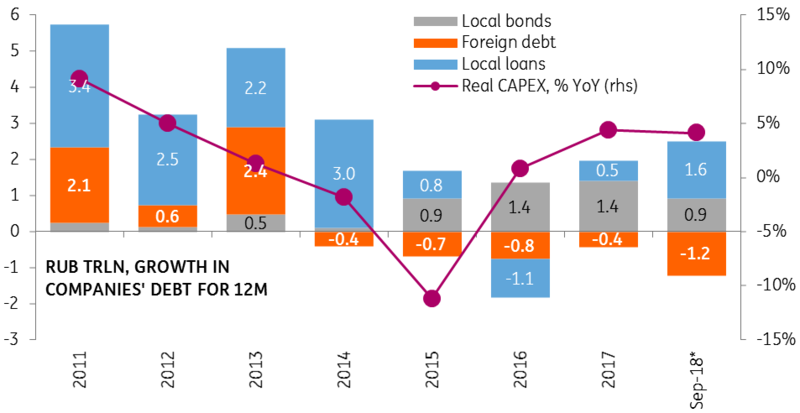 Some acceleration in the local corporate loan growth to around 6% YoY seen in 2018 reflects substitution of the foreign debt. 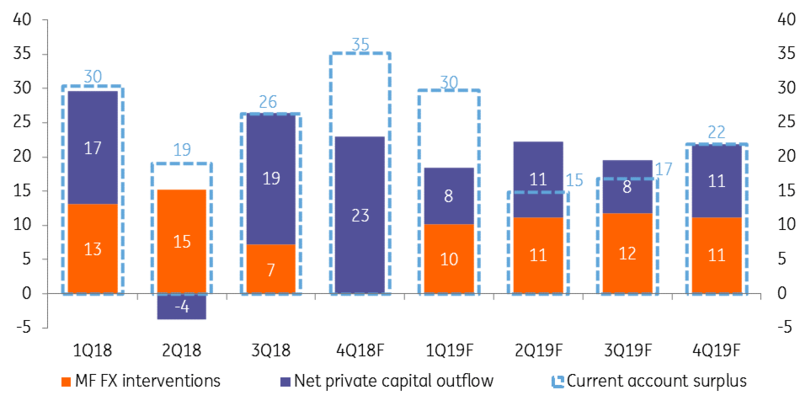 The quality of corporate loan growth is raising questions, as with the exception for transport and telcos (7% of portfolio), pick up in local corporate lending is driven by sectors with high NPL/leverage (construction, trade, agriculture – 24% of portfolio) or is unidentifiable (other, 21% of portfolio). Sectors with the highest quality (industrials, 41% of portfolio) are either deleveraging (oil exporters) or showing merely stable demand for local loans. Although limited investment demand and persisting sanctions predetermine continued corporate foreign debt redemption, under the house view of Urals crude oil at around $65/bbl, we see current account surplus as sizeable enough to finance $10-12 billion in quarterly FX interventions and $8-11 billion in the expected quarterly net capital outflow. In that respect, the recent indication by the central bank that FX purchases might resume in January 2019 shouldn't prevent rouble appreciation from the current levels, especially given that the current account surplus in 4Q18F and 1Q19F is $30-35 billion, providing an extra FX cushion. Combined with the moderately positive mood in the emerging market space, supported by doubts in aggressive Fed tightening and a ceasefire in the US-China trade conflict, this sets the stage for a stronger rouble at least in the coming months. Overall, we see the rouble less vulnerable to oil price developments than to emerging market portfolio flows. That said, the possible deterioration in the portfolio flows due to tightening in Ukraine-related sanctions or escalation in the US-China trade conflict not yet priced in by the market poses an obvious downside risk to our view. Non-residents are holding USD 27 billion worth of local state bonds (OFZ). In the case of new sanctions, they can reduce their positions by up to 30% as it happened in 2014. Each USD 5 billion of extra capital outflows correspond to the weaker fair value of the rouble by 1USD/RUB, but the short-term market reaction can be sharper. The $9 billion portfolio outflow from OFZ in April-October, which was driven by general emerging market risk-off, has resulted in almost RUB9/USD depreciation and around 150 basis points increase in benchmark long-term bond yields. With 14% year-to-date rouble depreciation, the recent spike in local gasoline prices and the upcoming VAT hike from 18% to 20%, inflation is accelerating from a low base. We see inflation reaching 4.0% by the end of the year and 5.7% YoY by mid-2019 before returning to the 4.5-5.0% YoY range by the end of 2019Y. 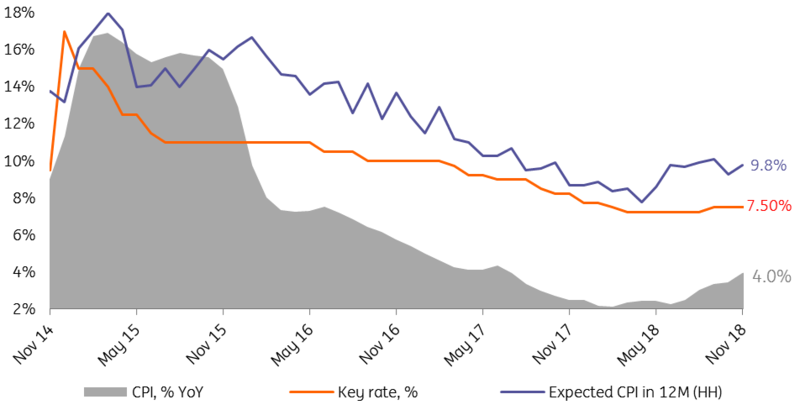 The upcoming spike in the CPI is already accounted for by the central bank and technically doesn't require an additional increase in the key rate, currently at 7.5%. Additional arguments against further hikes in the short term include stabilisation of households' inflationary expectations, freeze in gasoline prices, Russia's comparatively high real rates in the emerging market universe and weakening of the local GDP trend. At the same time, any easing in monetary policy is definitely out of the question, and the risks to our CPI and key rate views are skewed upwards. First, if the weekly CPI stays at 0.15 week on week level seen in the last three weeks, then our near-term inflation forecast will be exceeded, and the YE19 level may hit 4.2%, which is the upper bound of the central target range - a potential trigger for a hike. Second, the sustainability of the gasoline price freeze remains under question, unless some amendments to the fiscal parameters to the oil sector are made. Third, in case of further risk-off towards Russia (USA-China and/or USA-Russia tensions), the rouble can depreciate further, and each 10% rouble depreciation adds up to 0.5-1.0 pp to the CPI trend and could require extra key rate hike. Unlike the monetary policy, the budget policy could potentially be used as a tool to support growth or offset the deterioration of the external environment if it takes place. 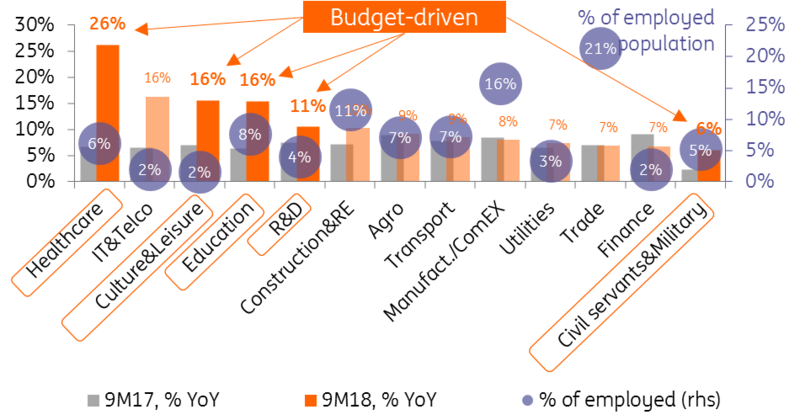 Currently, even with the state investment and social projects included, the 2019-2021F budget is drafted very tightly, assuming a 1-2% GDP surplus with the VAT tax hike, higher dividend collection from state companies and a reduction of expenditures to 17% of GDP, a 10-year low, and breakeven Urals has fallen to US$50/bbl. Unless the government is successful in reigniting full-scale investment growth (which would be a positive surprise to our outlook), this tight budget policy framework may prove unsustainable, especially if a decline in popular support for the political leadership continues. A combination of higher than expected spending and some fiscal easing for the oil sector to enable a sustainable freeze in the gasoline prices is possible in 2019. This could lead to pressure to ease the budget rule leading to a halt in accumulation or even net spending of the National Welfare Fund depending on the scale. The effect of any easing on growth is likely to be modest and unlikely to be seen before 2020. 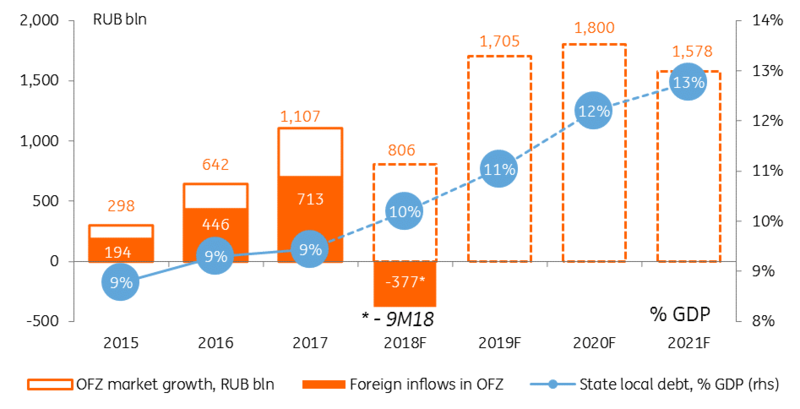 The persisting uncertainty regarding sanctions and emerging market risk sentiment creates risks for the local bond market, as foreign capital accounted for two-thirds of the growth in the rouble state bond (OFZ) market in 2015-17. This process was supported by Russia’s macro stability combined with expectations of the rouble's recovery and monetary policy easing amid favourable global sentiment towards EM risk. This trend broke in 2018, casting a shadow on the Ministry of Finance's significant RUB 1.6-1.8 per annum net OFZ placement programme for 2019-21F. We believe local banks, holding RUB 3 trillion of liquidity, could partially offset the outgoing non-residents. Also, the programme could be reduced if USD/RUB is weaker than the drafted 64 (by RUB1.2-1.3tr for every RUB10/USD) or if the budget rule is eased (by RUB1.5-1.8tr for every US$10/bbl increase in cut-off Urals price).